When my good friend was back in town during Christmas, we wanted to catch up over tea, so I suggested a few afternoon high tea places. Since it was the festive period, I tried to call to reserve a table, only to find out that all the hotel tea lounges were fully-booked that day. After looking through my list of new places to go, we eventually settled for a nice little cafe at Holland Village. I’ve heard a lot about Foster English Rose Cafe, but somehow, I just never got the chance to drop by. I’m happy to say that I’m glad that I finally did. I’m going straight to the point, because I don’t want to delay you from going down to Foster for tea. 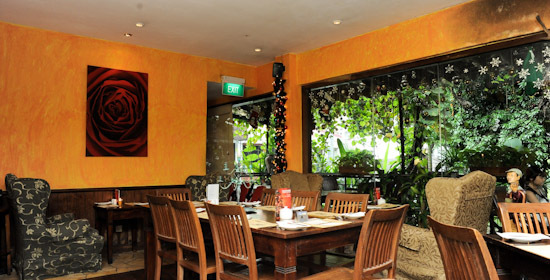 It is a lovely cafe to hang out with your friends, so remember to bookmark this post for your next outing. Stepping inside Foster, we immediately fell in love with the rustic charm of the cafe. It’s quite difficult to describe it with words, so I’ll leave it to you to find out. 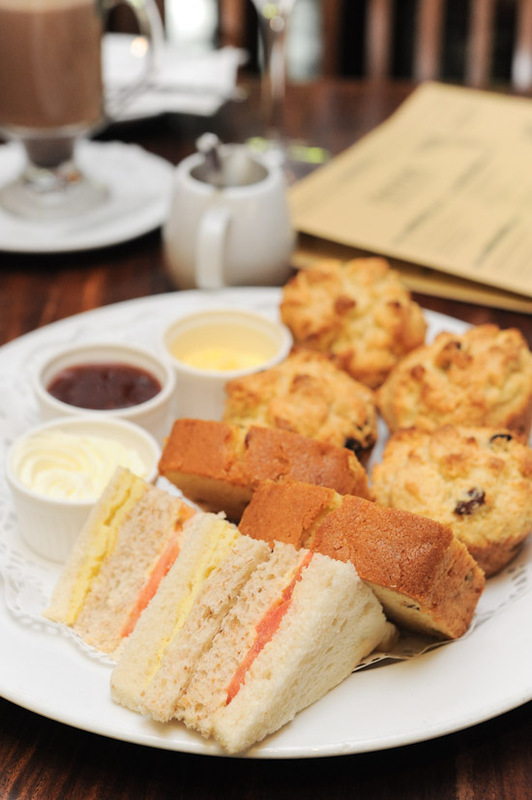 We ordered the Devonshire Cream Tea Set (served from 3pm to 6pm daily). 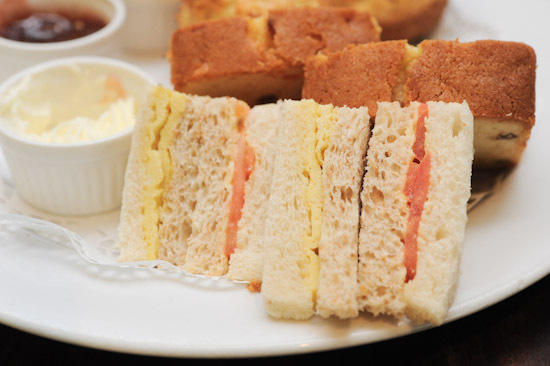 At $11, it is probably one of the cheapest high tea sets in Singapore. What you see in the picture above is for two. So it’s actually not a lot of food. Each person gets two scones, one slice of cake, two finger sandwiches, and coffee/tea. Served with jam, whipped cream and butter, the sturdy and dense scones were perfect. I lurveee the scones and I thought that the cake was also quite decent. The sandwiches, on the other hand, were mediocre and not worth mentioning. Just so you know, Foster English Rose Cafe at Holland Village is also a steakhouse and they offer a variety of dishes on their ala carte menu: English Farmhouse Fare like Cottage Pie ($16), and Seared Yorkshire Pork Rack ($26); Steaks like US Black Angus Ribeye Steak ($42) and their signature Fillet Fantastique ($42); and other main courses like Pastas, Fish and Chicken. What I’ve been wanting to say is, you should go to Foster not just because they have one of the cheapest high tea sets in Singapore, but also because they have a cosy and nice ambience which is perfect for a lazy afternoon. That is all you need to know. See you at Foster. oh yes! i work around HV and has been there for lunch. we sat at the al-fresco area and it was so comfortable. nice place to laze around & have lunch followed by high tea! opps. also, their a la carte dishes’serving size is good for 2 to share. I love dinner @ the Foster’s. A bit expensive for me, but their Chicken ala Kiev is awesome! Great Review! Love the tea set too. BTW it’s ‘Fosters’ with an ‘s’.